This is a closeup of the typing unit in the ASR 33 Teletype teletypewriter set main assembly. In the front with the silver bearings against it is the power bail which provides the drive to activate the typing unit which rotates and drives the type wheel against the paper. 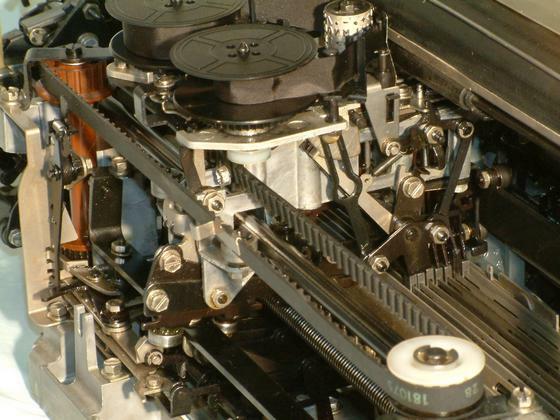 The toothed rubber belt is used to move the typing unit for each character. Behind it is the codebars with the U shaped levers of the typing unit on them. The codebars have the parallel binary data and the typing unit uses their position to control the rotation and vertical position of the type wheel to select the correct character.